Alternative facility options -- spotlight on: happy campers! Home»Blog»LEADERSHIP»Church Growth»Alternative facility options — spotlight on: happy campers! Located in the h eart of Oklahoma — halfway between Tulsa and Oklahoma City, where many of the state’s Assembly of God churches are situated — this new camp replaced the denomination’s popular Turner Falls camp, which hosted thousands of young people more than 50 years. At the center of the new camp was a brand-new worship center for more than 1,000 people. 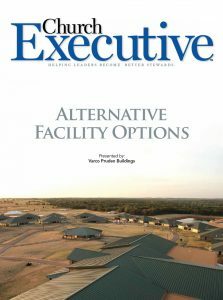 A facility this large — which, given its unique environmental and site challenges, didn’t lend itself to traditional construction — was no easy feat. After all factors were accounted for, a pre-engineered metal building from Memphis-based Varco Pruden fit the bill. For one thing, the new worship center needed to be a free-span structure — an open space with no columns. This was possible with a metal building because of the engineering and strength of the steel framing. Better yet, the space could be free-spanned without incurring the cost of conventional structural steel construction (namely, extensive drawing and engineering). Instead, metal building systems consist of framing, roof and wall systems as part of an integrated package — a single-source solution. Second, the weather and site itself were forces to be reckoned with. The wetness of the winter and spring months, combined with the soft Oklahoma clay, proved challenging. All things considered, a metal building made the most sense in the end. It features a rigid framing system, as well as an architectural roof system — for aesthetic appeal — and metal exterior wall system. RPR™ Panel, Varco Pruden’s reverse-rolled, Galvalume® wall panel system, was also employed; so was the Cool Leaf Green SLR II™ roofing with KXL™ finish and Classic Beige Panel Rib™ walls. Earth tones were selected to complement the surrounding landscape. Lest you think a metal building automatically means a “warehouse look” — with little opportunity for customization —take a look at the finished worship center project at the camp. It features an inviting wrap-around porch with rough-sawn cedar veneers and stone arch entries to match the dining hall. A three-tiered gable entry roof and a 30-foot cross tower welcome worshipers. 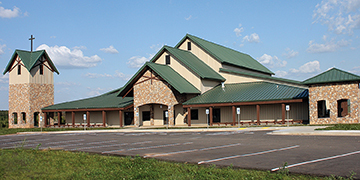 The “country-style church” fits in well with the scenery, thanks to its green metal roof and beige metal wall panels. It looks good. But more important, the worship center does what it was intended to do: comfortably accommodate 1,000 campers, staff and adult volunteers. This level of customization continues throughout the site. Built on a 410-acre parcel of land a few miles south of Chandler, OK, the camp’s rolling acreage has woods, meadows and several ponds — including manmade 5- and 20-acre lakes. Campers and guests enjoy fishing, swimming, paddle boats and a “blob” water feature — a large, air-filled inflatable rubber tube floating on the water. Campers can jump on to the attraction from a 20-foot tower. To “feed” these amenities, water was brought to the site from Chandler, channeled with a huge underground concrete water reservoir. A water treatment facility was constructed and installed, as were large septic ponds to treat waste water. Campers enjoy six RV camp sites and primitive camping; five outdoor basketball courts; five sand volleyball courts; five “high-five football” courts; a 5,000-square-foot log cabin for executive sleepovers; and 16 modern cabins. Each cabin spans 6,000 square feet and features four large bunk rooms to accommodate 64 campers and staff — including private restrooms / showers — surrounding a central commons area. To feed up to 1,000 campers, a 23,000-square-foot dining hall was built, complete with four commercial buffet-style serving lines and a full commercial kitchen, including 600-square-foot walk-in coolers and freezers. And that’s not all on the food front: The camp also boasts a 5,000-square-foot concession stand with an octagonal design. This eight-sided footprint allows for serving counters to be positioned around the core and for open seating to be situated around the perimeter. It’s worth noting that the concession stand wasn’t originally intended to be a metal building. However, Oklahoma is prone to tornadoes, and the structure’s original plan, which called for a wood, octagon-shaped roof — supported by wood columns and beams — would be prone to damage in inclement weather. To ensure safety and stability, contractors changed the structure to a steel building during the construction process. For continuity and safety, the roof contours and elevations were carried through the other buildings on the site. 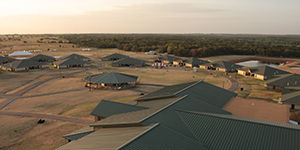 For ultimate comfort, all the new buildings on the camp site are air-conditioned. This is an especially welcome upgrade in the summer, when temperatures regularly exceed 100 degrees. The Oklahoma Assembly of God State Youth Camp is a sprawling, impressive setup. By any camp’s standards, it’s top-of-the-line. What makes it a destination for the denomination, however, is the worship center. It’s the heart of the project. By thinking outside the box — and considering a non-traditional building option — this critical space is everything the owners wanted, and more. Erin C. Townsend is public relations coordinator for Memphis-based Varco Pruden Buildings, a division of BlueScope Buildings North America, Inc. Varco Pruden markets its products through a network of more than 1,000 authorized builders within the United States and Canada.